It's been a long time since I last posted my [Outfit Diary] posts, but if you remember last month I wrote about my current wish list which is : Rompers. In that post I mention about Dress-In website which is an online fashion store that serves Internationally. I wanted to try a lot of them including a cute little pineapple-print shorts and a gorgeous sheer maxi gown with red floral embellishment - that I saw on their website. But finally I made my choice. I chose some items that I know I'll wear and I needed for the time being. 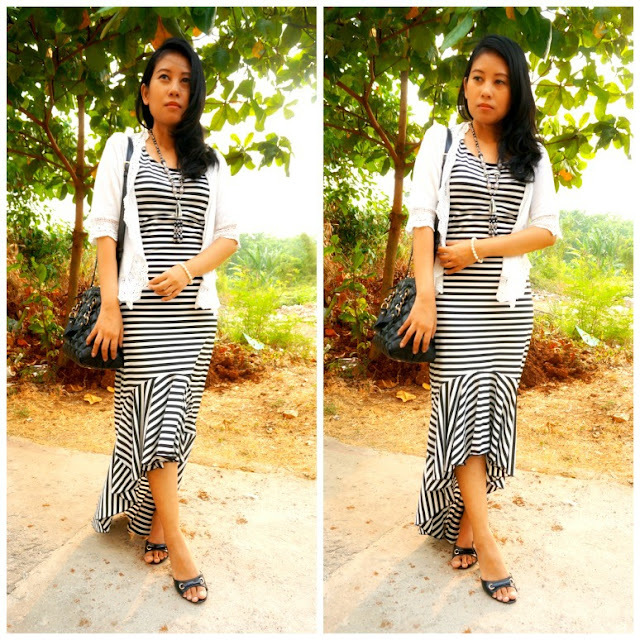 My choice was a white plain blouse which I can mix n match, and a stripe maxi dress with hi-lo cutting. I realized that I don't own a plain white blouse so I thought I needed one to mix n match with the rest of my wardrobe. A white plain blouse is a must-have basic item in your wardrobe because it's very versatile and you can dress it up or dress it down. Even if I already have a white buttoned shirt I still need a plain white blouse like this because it's more casual than a white buttoned shirt. Meanwhile the stripe maxi dress is something that I really really like. There are so many things that I love about this dress. 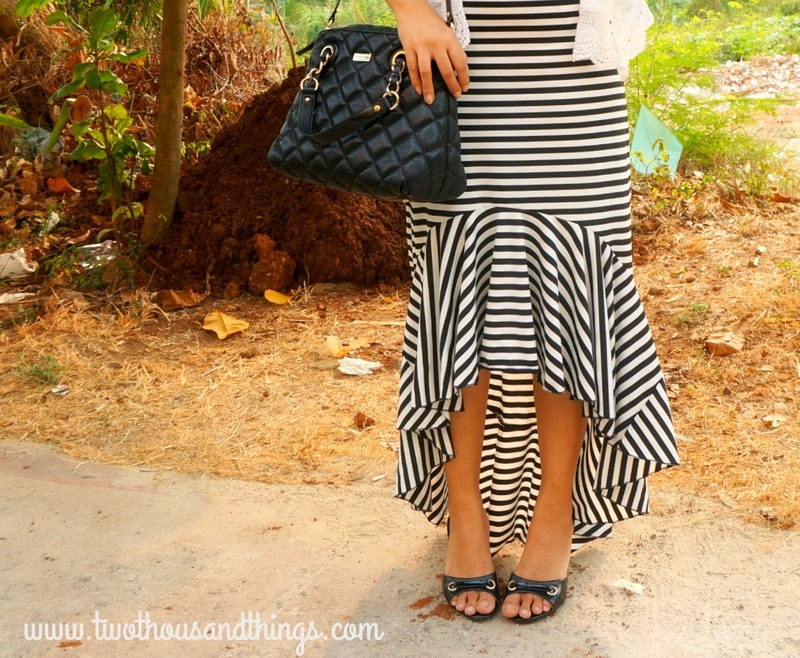 I am a big fan of maxi dresses, I love stripes, I love hi-lo cuts, and I also love ruffles. And this dress has everything I want! The irregular hem (hi-lo cut) with ruffles on the edge is what really sold me. It is made of polyester material and this dress looks very legit in real life. Looks like something that you'd paid more than $9 for! But the truth is this dress is only less than $9 at DressIn website. You can see more of the details here. This dress comes in different sizes and I ordered the smallest size which is size S. It fits me just fine on the bodice but it's a tiny bit too long for my short leg (because I'm very petite). But no worries, I can always wear heels with this dress :) - problem solved! This is actually a sleeveless dress but here I'm layering it with a white lace cardigan to add the feminine effect even more. I also wore heels, added some black & white accessories for an elegant monochrome look.